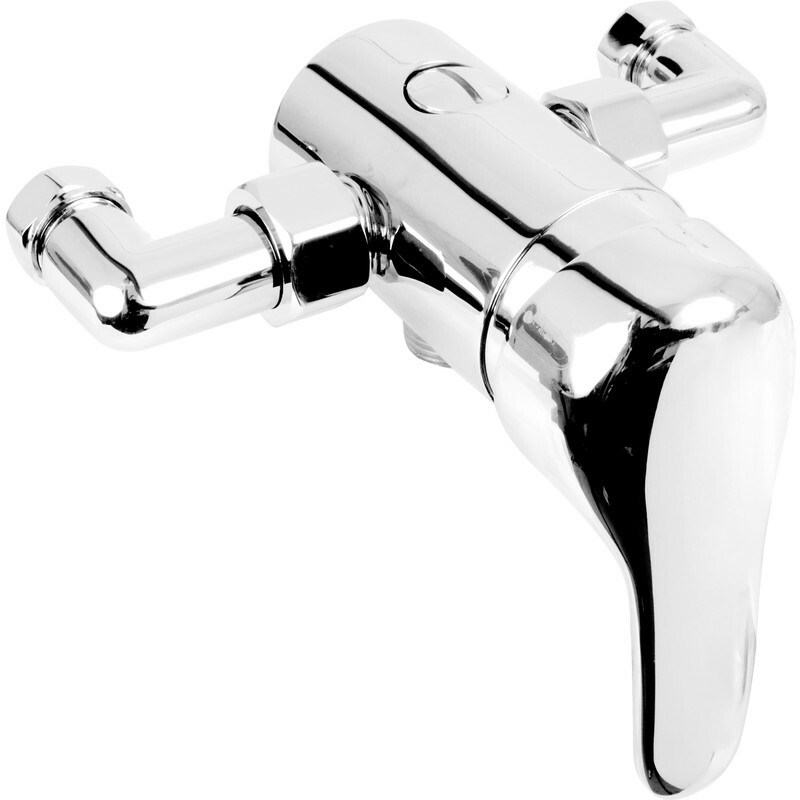 Modern Manual Mixer Shower Valve is rated 4.7 out of 5 by 18. Rated 5 out of 5 by GS Rider from Excellent for the price Decent quality valve, simple to install and customer very impressed overall. Rated 2 out of 5 by FixAnything from Does what we wanted but not without issue I bought this manual mixer valve to replace a thermostatic valve that had stopped working properly after upgrading from an oil boiler to cooler running heat pumps. The original shower was surface mounted on the wall but the pipes were set in to a solid wall behind tiles. I was therefore very careful to select a replacement mixer with the same dimensions of 15mm compression pipes at 150mm centres, which is exactly what this manual mixer valve is advertised on the website as being. When it arrived, it looked good and I was expecting a fairly simple swap – one for one. Having taken the old one off and offering up the new one, I was very disappointed to find the new manual valve did not line up with the pipes in the wall. A quick check and the pipe are definitely 150mm but the new valve was 155mm centres and not the advertised 150mm. Taking the strainer seals out of the two elbows on the value, it was possible to just squeeze it down to 150mm but it of course leaked. Time was of the essence and luckily having access to a workshop, the elbows were machined to give the extra clearance to re-fit the strainer seals and achieve 150mm centres. The valve then fitted perfectly and works exactly as anticipated. The other negative is a noticeable cavitation noise, when the valve is in operation, which is annoying but we can live with it. The fact that the pipe connection spacing was not as published was what I found most unacceptable - For goodness sake get product information correct on your website! Rated 5 out of 5 by Lairdie from Great features I bought 2weeks ago got itplumedin but haven't tried it yet. Rated 2 out of 5 by Osie from No details. I can understand shortage of space in the printed catalogue. But there is limitless space on the website. I am going to have to return these as the connections are smaller that the shower valve I want to replace. There are so many items in the catalogue where you gambol on what you will get. Surely just a few minutes to give a good basic description would increase sales. Two minutes of someone's time can save thousands of customers time. Rated 5 out of 5 by Tommy67 from basic but good Bought valve to replace faulty one while waiting for full upgrade to shower. Brilliant price and easy to fit . Rated 5 out of 5 by Djhope from Fantastic product Bought to replace a broken mixer. This shower doesn't get a lot of use so I wanted a cheap and cheerful one. I was astonished by the quality and build of this product.